Giving a thoughtful and generous gift: Your friends and family have done it before and will want to do it again, especially to celebrate a special milestone in your child's life, like a birthday or a graduation. To show your appreciation for their kindness, make things easier. Save your loved ones the hassle of traipsing through toy stores, asking for gift receipts, and wrapping bulky packages—invite them to make a contribution toward your child's education. Many grandparents and older investors use 529 plan accounts to pass money along to family members, allowing them to reduce their own estate tax exposure while helping a special child in their life pursue higher education. Plus, when a grandparent owns a 529 plan account, the assets in the account have no impact on the child's eligibility for federal student aid (although distributions from a grandparent's 529 plan account will need to be reported as the child's income). There's no limit to the number of 529 plan accounts on which your child can be the beneficiary. The total amount of 529 account assets for a single beneficiary generally ranges from $200,000 to over $350,000, depending on the state. If your child is already the beneficiary on a 529 plan account, it's easy to invite friends and family to give college savings using Ugift®—Give College Savings. Ugift is an automated, online program that allows you to send a notification to your loved ones that lets them know exactly what tops your child's gift wish list: a contribution to his or her existing 529 plan account. You can send notifications by email or print them to include in party invitations. 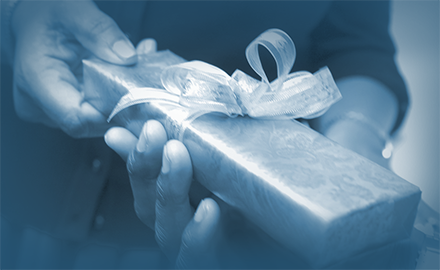 Ugift has been enhanced so your friends and family can make contributions to your child's 529 plan account online—making it easier than ever to give your child a truly meaningful gift.